Seniors who exercise using the features of interactive video games experience greater cognitive health benefits than those who rely on traditional exercise alone, a new study finds. This news could make exercise more appealing to older adults and help stave off conditions such as dementia, one of the most debilitating effects of aging. “We found that for older adults, virtual-reality enhanced interactive exercise, or ‘cybercycling’ two to three times a week for three months, yielded greater cognitive benefit and perhaps added protection against mild cognitive impairment than a similar dose of traditional exercise,” said Cay Anderson-Hanley, assistant professor of psychology at Union and the project’s lead researcher. Anderson-Hanleycollaborated with Paul Arciero, a professor of exercise science at Skidmore College. The study appears online and in the February issue of the American Journal of Preventive Medicine. To learn more, click here. Research shows that exercise may prevent or delay dementia and improve cognitive functioning in normal aging. Yet only 14 percent of adults 65-74 years old and 7 percent of those over 75 report regular exercise. The idea behind the new study was to motivate more seniors to exercise by capitalizing on the popularity and competitive fun of video games. Participants could compete against themselves or others. 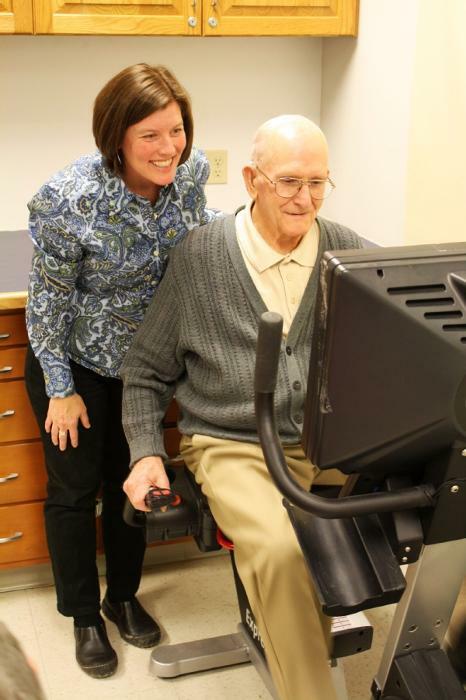 Hanley’s team of researchers, which included students from Union and Skidmore, monitored the physiological, neuropsychological and behavioral impact cybercycling had on seniors recruited from eight independent living centers around the Capital Region. The final study involved 63 volunteers, ranging from 58 to 99 years, who averaged three rides each week for three months. Approximately half of the study group rode recumbent stationary bikes, while the other half rode cybercycles, specially designed bikes equipped with a virtual reality display. Cybercycle participants experienced 3D tours through places like the Redwoods of California and the cactus trail in Arizona. They also raced against a “ghost rider,” an avatar based on their last best ride. Researchers evaluated executive functions such as planning, working memory, attention, and problem solving. Blood plasma was tested to measure whether a change in brain-derived neurotrophic growth factor (BDNF) indicated possible neuroplasticity, a mechanism of change that could link exercise to cognition. Cybercycle riders had significantly better executive function, which affects multi-tasking and decision making, than those who rode a traditional stationary bike. And cybercyclists experienced a 23 percent reduction in progression to mild cognitive impairment compared to traditional exercisers. “No difference in exercise frequency, intensity or duration was found between the two groups, indicating that factors other than effort and fitness were responsible for the cognitive benefit,” said Arciero, of Skidmore. The study also found a significantly greater increase in BDNF among cybercyclists than in traditional riders, suggesting that interactive/combined mental and physical exercise may lead to cognitive benefits by way of biomarkers linked to neurotrophic effects. Participants in the study said the challenge of outpacing avatars motivated them to exercise more. “It made it a lot more fun,” said Gladys Moore, 89, while cyber-racing through the streets of “Palm Beach” in Union’s Healthy Aging and Neuropsychology Lab in Bailey Hall. Moore, who exercises regularly, logged nearly 400 miles on the cybercycle for the study. She’s struggled to get her fellow residents at nearby Schaffer Heights to exercise. That’s what researchers hope, as well. “The implication of our study is that older adults who choose ‘exergaming’ with interactive physical and cognitive exercise over traditional exercise may garner added cognitive benefit, and perhaps prevent decline, all for the same exercise effort,” said Anderson-Hanley. The two-year study was funded by a grant from the Robert Wood Johnson Foundation to explore how interactive digital gaming can improve the health behaviors and outcomes for people age 50 and older.